COX'S BAZAR, Bangladesh — With thousands of Rohingya refugees streaming daily across the swampy border into Bangladesh, one hospital was struggling to treat dozens of men who had arrived with broken bones, bullet wounds and horrific stories of death. Already, some 87,000 Rohingya Muslims have entered Bangladesh, fleeing violence in western Myanmar that erupted Aug. 25. They have filled three older refugee camps set up in the 1990s. "The existing refugees have taken in the new arrivals into their homes," UNHCR spokeswoman Vivian Tan said Monday. Thousands more were sheltering in local villages, or in open fields — wherever they could find space. "What we desperately need is for land to be made available to get more emergency shelters up," as well as help with other aid supplies, Tan said. "These people have been walking for days. They likely have not eaten since they left their homes," Tan said. Many needed medical attention for respiratory diseases, infections and malnutrition. "They are exhausted, they are traumatized ... There are babies, some newborns, who've been exposed to the elements." On Monday, at the Cox's Bazar Sadar Hospital about two hours from the border, doctors were treating 31 men who arrived "distressed and afraid" with broken bones and bullet wounds, mostly to their limbs, according to the resident medical officer Dr. Shaheen Abdur Rahman Choudhury. They all told similar stories of Myanmar soldiers opening fire randomly on their villages in western Myanmar on Aug. 26-27 and setting buildings aflame, Choudhury said. One family that crossed into the border town of Kutupalong on Monday told the Associated Press a land mine had blew off the right leg of their elderly relative. The woman was bleeding profusely as her wailing relatives bundled her into an autorickshaw and rushed to a hospital. The woman's lower right leg had been blown away by the impact of the explosion. Her left leg and parts of her hands also appeared seriously wounded. The hospital, already "hugely overburdened," was expecting to receive many more wounded refugees, said the doctor, Choudhury. "What we are seeing is the tip of the iceberg." On Aug. 25, Rohingya insurgents attacked at least two dozen Myanmar police and paramilitary posts in coordinated attacks they said were intended to protect their ethnic minority from persecution by security forces in the majority-Buddhist country. The military responded with what it called "clearance operations" to root out the insurgents it calls ethnic terrorists. The violence led the U.N. World Food Program last week to halt aid deliveries to some 250,000 people in Rakhine state. 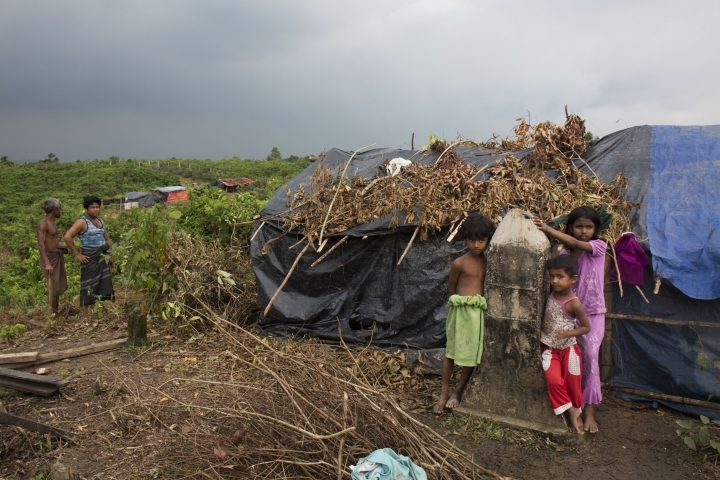 The Rohingya have long faced discrimination in Myanmar but bloody rioting in 2012 forced more than 100,000 into displacement camps in Bangladesh, where many still live today. On Monday, Pakistani rights advocate Malala Yousafzai condemned the violence against Rohingya, in a Twitter statement. 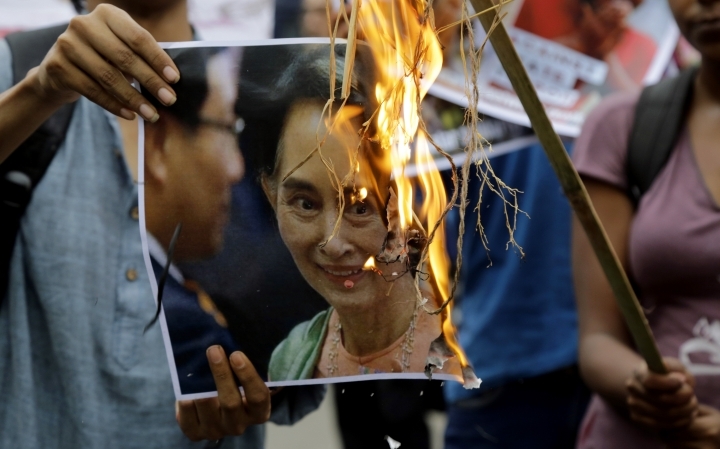 "I am still waiting for my fellow Nobel Laureate Aung San Suu Kyi to do the same," she said of Myanmar's leader. 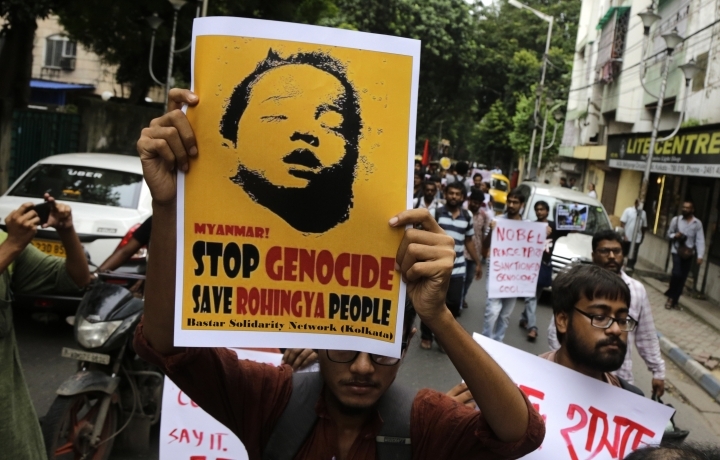 In several cities internationally, Rohingya, other Muslims and activists protested the violence and called on their own governments to take a tougher stance against Myanmar's government. 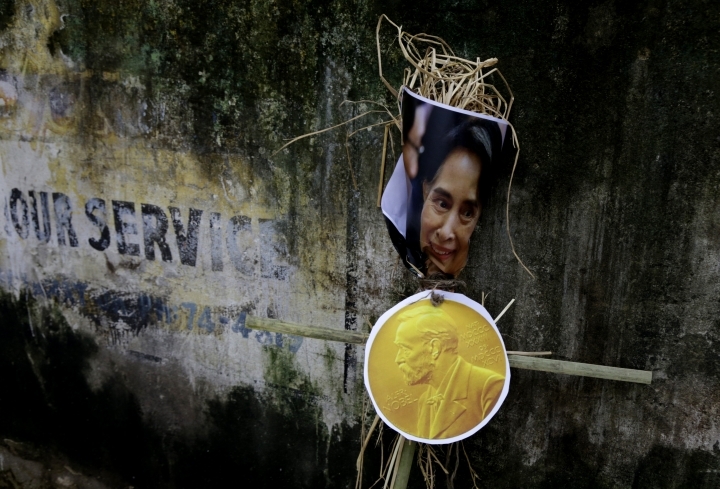 Some of the protesters denounced Suu Kyi by name and even burned or defaced posters bearing her image. 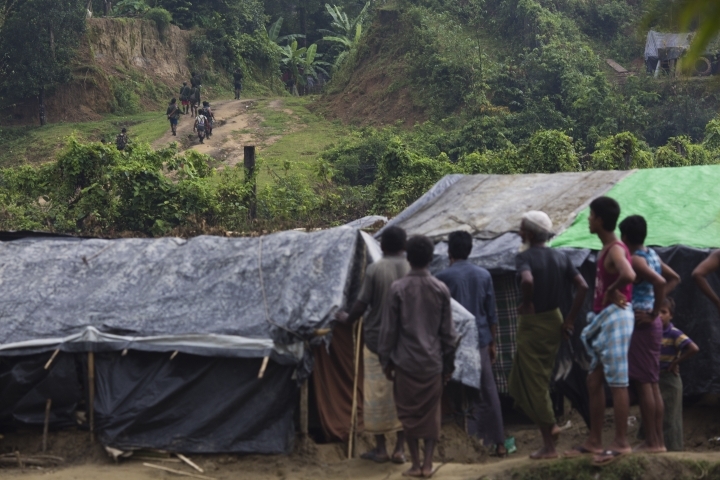 Myanmar security officials and Rohingya insurgents have accused each other of atrocities. The military has said nearly 400 people, most of them insurgents, have died in clashes. 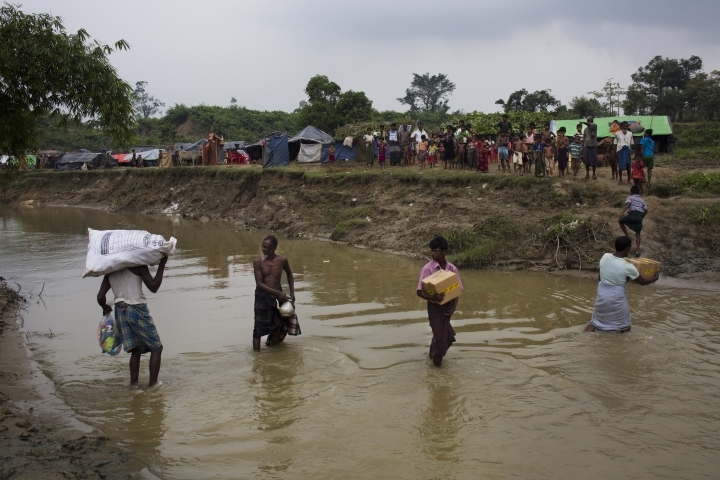 Bangladesh police say dozens of Rohingya have died attempting to cross the river separating the two countries. Myanmar's government blames the insurgents for burning their own homes and killing Buddhists in Rakhine state. Outside the hospital in Cox's Bazar, three Rohingya men and a teenage boy who had been treated for bullet wounds described soldiers shooting at people and burning buildings. Mohammad Irshad, 27, told AP he saw at least eight bodies after his village near the coastal town of Maungdaw was visited by at least 30 soldiers, who he said opened fire indiscriminately and then set fire to homes and other buildings. The 16-year-old Mohammed Osama said he'd tried to flee into the forest when soldiers entered his village on Aug. 26, but was shot by one of them in the thigh. With a gaping bullet wound in his leg, he was carried by his father and some of his 11 siblings across the border. His family joined thousands now packed into the Bangladeshi fishing village of Shah Porir Dwip. But Osama and others were squatting behind the hospital in Cox's Bazar, their only belongings a few bedsheets and personal documents in plastic bags. 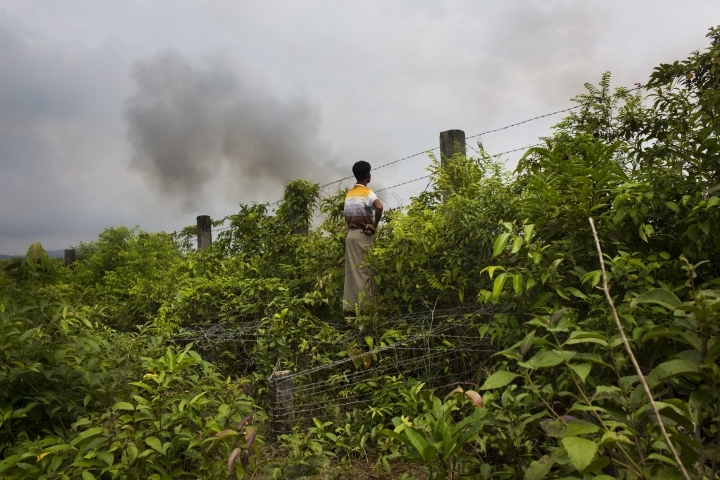 Yet another Myanmar village near Maungdaw was destroyed by about 50 soldiers, according to 25-year-old Mohammad Arafat. "I started running when the firing started and lost track of both my parents. I don't know if they're dead or alive," Arafat said. "They're cutting up people, shooting people. I'm very afraid. I never want to go back." His wife and mother-in-law were sheltering in the border area of Teknaf, but Arafat sought treatment for his wound. He was told he needed further treatment at a hospital in the city of Chittagong, he said. "I have no money. I don't know what to do." Follow Muneeza Naqvi at www.twitter.com/mnaqvi10.